We try The Old Fellow in Rhodes, partly for the fnarr-fnarr name, but mostly for the menu. We travel all the way from crusty Newtown to utopian Rhodes just for that menu, it's a doozy. There's a bunch of new-to-us dishes that we're busting to try, plenty of spice, some hearty hotpots and some great salady dishes to balance it all out with. Complete with pictures. The Old Fellow is one of the newer style hole-in-the wall joints: fresh paint, downlights, pleather, and licensed. 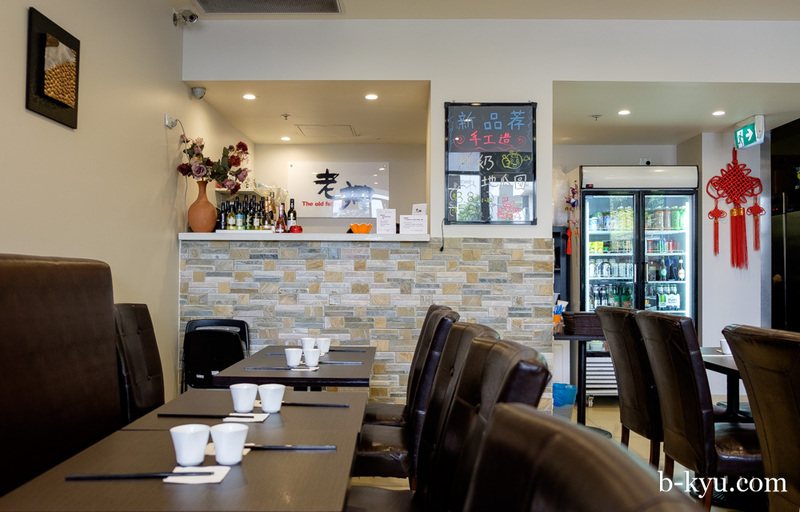 It's modern yet retains that sought after old school family-run vibe with uber nice wait staff and sounds of happy chatter and laughing in the kitchen. We love a bit of Old Fella. Stewed pork ribs with vegetables and small golden bread - $16.80. 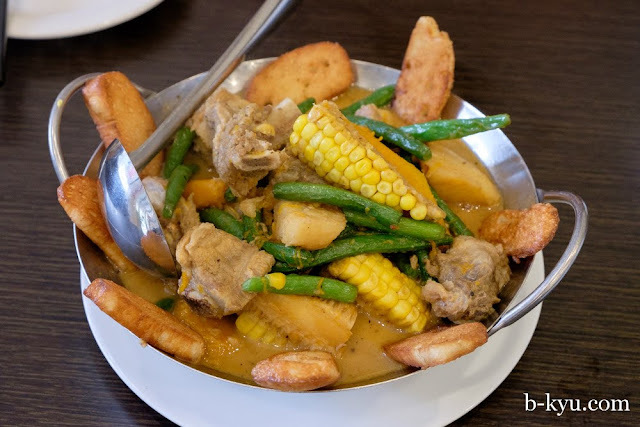 Bony pork hunks in a meaty broth with veggies and deep fried bread. It's a complete meal in one dish. The bread is awesome, like bready chippies. Spicy vegetable salad - $7.80. We ordered this accidentally and it turned out to be a very happy mistake. 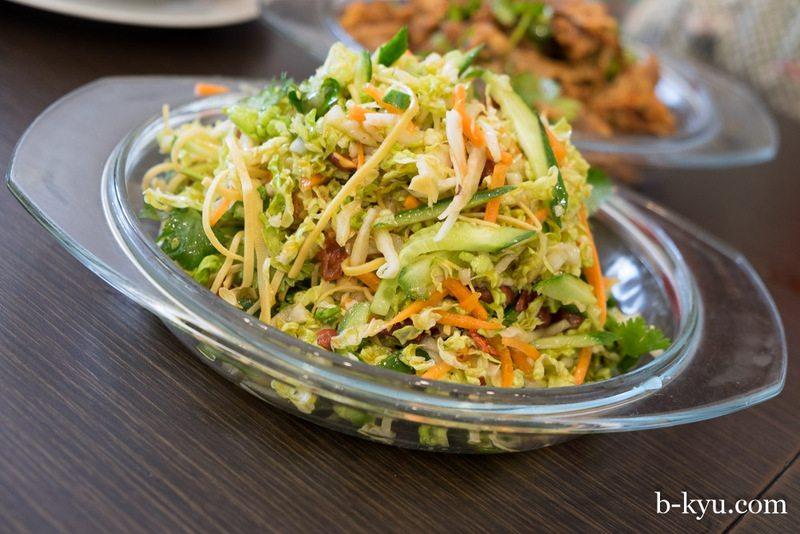 Shreds of cabbage, carrot, cucumber, tofu skin, peanuts, coriander and chilli flakes served cold. We like the dressing so much we try to replicate it at home, but we can't quite make it the same. We guess the dressing has vinegar, salt, sugar, and sesame. Mix chicken bones in cumin and chili oil - $9.80. Alison goes nuts over this one. Chicken carcass pieces fried in crazy mouth Sichuan pepper and chilli, with a handful of coriander leaves. This is a wise use of leftover chicken, we're going to try this at home too. Highly recommended. Spicy shredded tofu - $8.80. 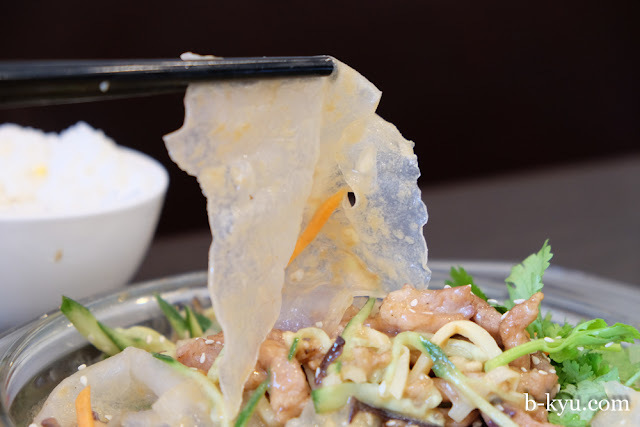 Not so spicy but a good garlic hit, those shredded tofu skins have a wonderful texture. Served cold. We always love this dish. 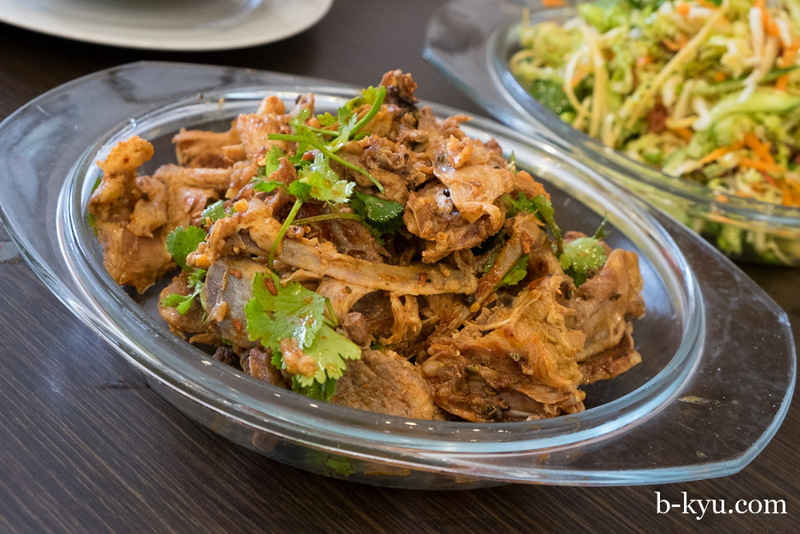 Shredded pork with tossed mung clear noodles in sauce - $14.80. 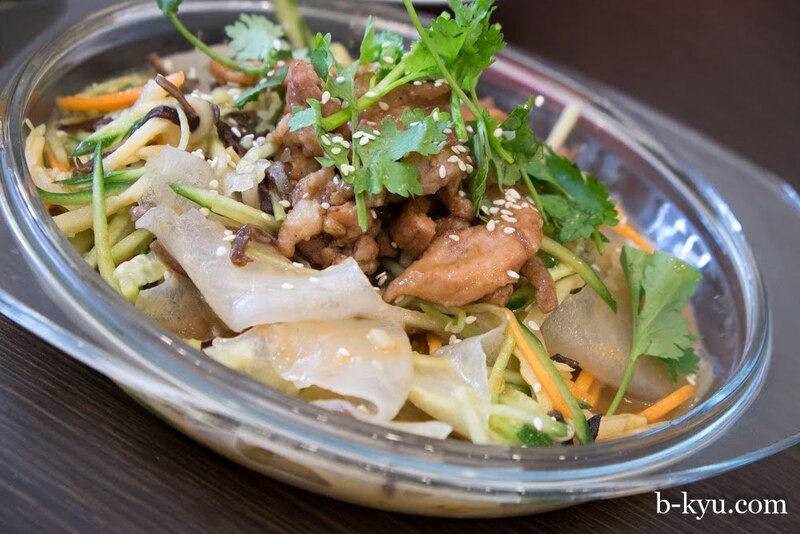 A cold salad style dish, slivers of veggies, large flat clear noodles in a peanut sauce, topped with a little stir fried pork. Those big flat clear mung noodles have a wonderful texture and are excellent sauce moppers, perfect in a cold salad dish. 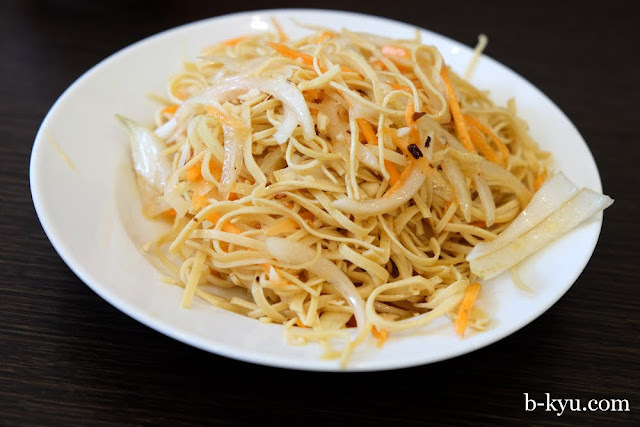 Dry fried shredded squid - $16.80. 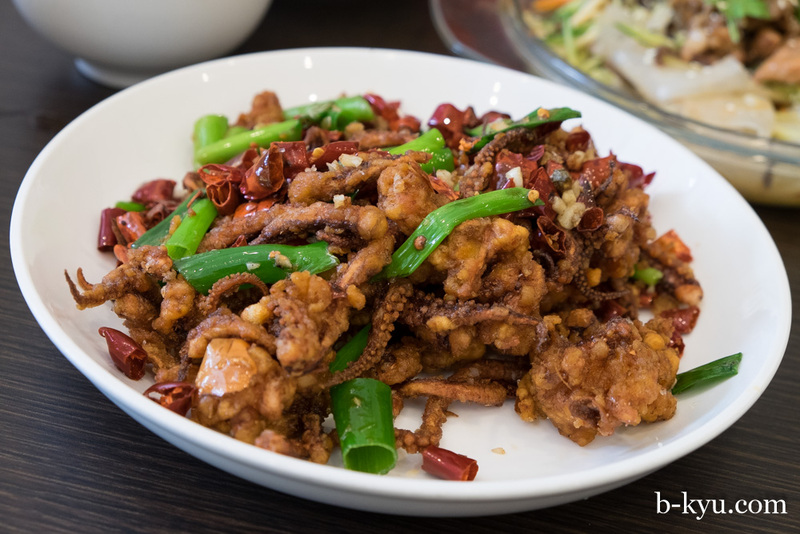 Crunchy deep fried squid pieces with loads of roasted chilis. It's perfectly kosher to fish out the squiddy bits from the sea of roasted chili, the chili mostly is for flavour, it's a slow-eating dish. A word for the lunching wise - there's a lunch special section in the menu. 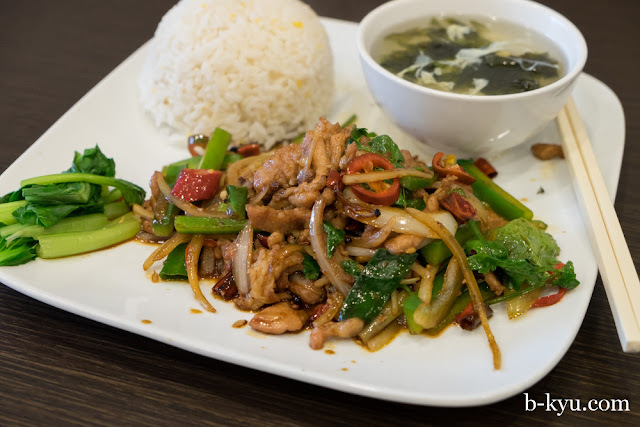 We try fried shredded pork with spicy vegetables with rice and soup $11.80. Usually ordering a dish you cook yourself a lot at home leads to disappointment, but this we like a lot. We can get the same flavour using Sichuan pepper with fresh and dried chili, but the pork tastes way better than what comes out of our wok, and we loved the way the vegies are mixed in: slithers of capsicom, onion, carrot, Chinese greens with coriander. It's a lot to write about a simple stir fry, but it's a good one. The Old Fellow is at Shop 8, 7 Rider Boulevard, Rhodes, a few doors down from the shopping mall. We found an amazing walk from Rhodes to Cabarita, along the Paramatta River\Kokoda Track Memorial Walkway, via the arse end of the massive Concord Hospital, an old repatriation hospital with huge gardens, detour through Yaralla Estate if you've got the energy; then stop for a beer at the Palace Hotel in Mortlake, which you will need to deal with the white picket country club weirdness of Breakfast Point, then jump on a ferry at Cabarita. Joy. A quicker walk is through Bicentennial Park to Olympic Park, a good hot weather option. You guys are unbelievable !!! 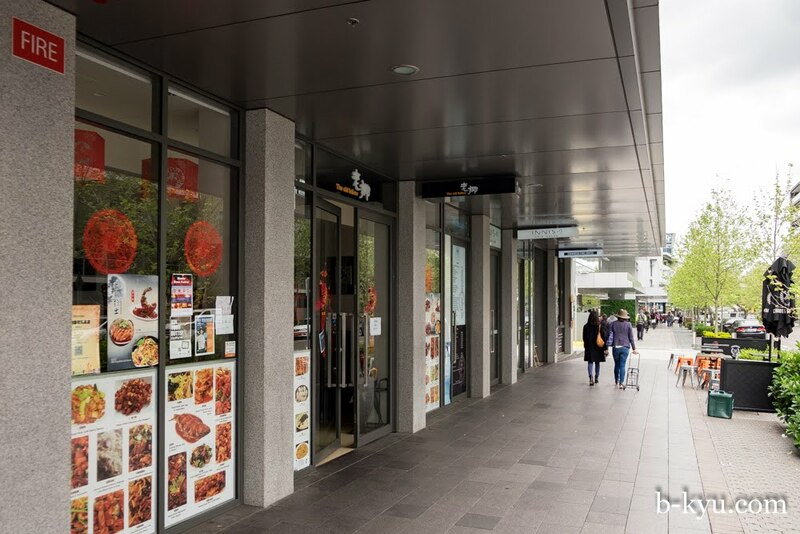 Happy's is a Canberra institution. Many time I have defended down that stairway to a "Happy Place". Did you notice the mural of the Great Wall of China. That was painted by "Happy" (the founding father. These days the son runs the joint)? Quite a talented fellow I think. Did you have problems with the owner taking photos inside? My experience was unpleasant as "Mr Happy Jr" demonstrated his displeasure when I was taking photos inside during my short reign as a food blogger. Nice tip on the painting, it was quite striking. I thought I might have got a dirty look, but I put the camera away pretty quick!